Gatherings of more than six people for a communal meal at a restaurant continue to be one of the more irritable dining experiences that I, for some reason, find myself repeatedly paying for the pleasure of having. Every time, I find myself walking away with the song “Never Again” firmly in my heart … and then, with the frequency of a dental-cleaning reminder, another one of my friends insists that the best way to celebrate his or her birthday is with a collective of friends from different groups in your life who only ever interact with one another the one day we are forced to. 1. The person who is vehemently against splitting checks—no ifs, ands or buts: A position I could understand if there were one or two people who spent egregiously more than others, but if no one splurged on the surf and turf and there are 10 of us with comparably priced entrees plus a drink, demanding an itemized distribution is the easiest way to get on everyone’s s—t list. If the differential comes out to plus or minus $5 to $10, you’ll be fine. 2. The asshat that orders the surf and turf, seven bottles of wine and dessert: Stunt on your own time. We are all here to eat our medium-priced chicken carbonara, hug the guest of honor and go home. Save the spot for later if you must find out what their pig roast tastes like, but leave us out of that receipt, please. 3. 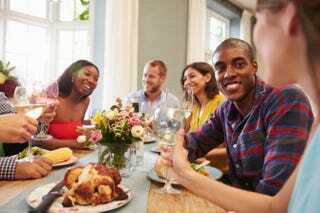 The person who only has exactly enough for the sticker cost of his or her meal: Ignore the fact that, the bulk of the time, these events usually have a guest of honor, such as a birthday person, whose meal will usually get comped by the group. You’ve made it all the way to adulthood and need to be reminded that tax and tip are a thing?! Unless the server was refilling our water while regaling us in detail about his or her Ku Klux Klan sympathizer schedule, there is no reason not to appropriately tip someone who had to manage a large group of guests on one ticket. Plus, gratuity is almost always included in the tab for large parties. Go back to whatever mole tribe you came from, but leave your $37.95 behind. 4. The person who shorts his or her part of the bill but won’t own up to it: It’s 11:15 p.m., everyone is full and tired and ready to say their goodbyes, but somehow we are 20 bucks short and no one knows how. Don’t be that person unless you want to be thoroughly embarrassed by me. Let someone know if you ain’t got it; more than likely, that person will be able to spot you. Or, an even more novel idea: Don’t go out if you don’t think you can afford the expenditure. Novel idea, I know!